The story circulates around a mysterious and dangerous island referred to simply as "G". A long time ago, a powerful god named Gestalt was banished to the earth and he had found refuge in the island known as G. To utter the name for which it stands is forbidden, for people were so afraid of the wrath of the god that they considered his name a curse. Father Oliver is a priest who has left his order and traveled to the island of G in order to discover the truth behind it. He ends up making the acquaintance of a young girl named Ohri, who turns out to be quite adept in magic. Meanwhile, the head of the order has hired a dark elf named, Suzu, to track down Oliver and bring him back. Suzu finds him easily enough. However, she hadn't anticipated the powerful sorceress in his company, Ohri. The girl disposes of Suzu for the moment, and she and the Father continue on. As if things weren't rough enough, the island of G has it's share of monsters and magic-users to get in the way of their travels. 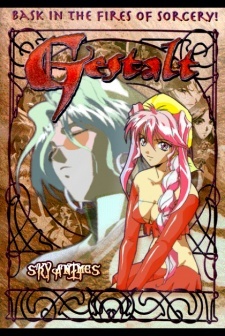 Watch Choujuu Densetsu Gestalt Episodes Online at Animegg.org. Choujuu Densetsu Gestalt is available in High Definition only through Animegg.org. Choose an episode below and start watching Choujuu Densetsu Gestalt in Subbed & Dubbed HD now.